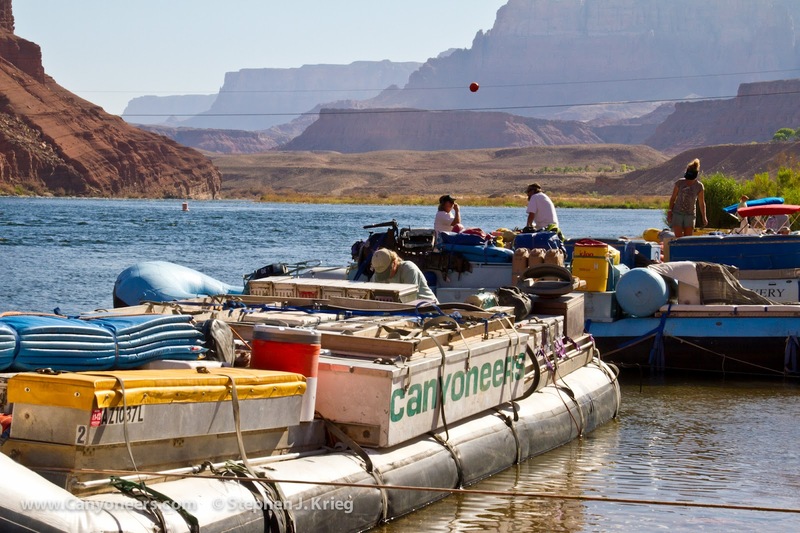 Lees Ferry in the Glen Canyon National Recreation Area, fifteen miles downstream of Glen Canyon Dam, is where all boats running the Colorado River through Grand Canyon National Park put in to the river. 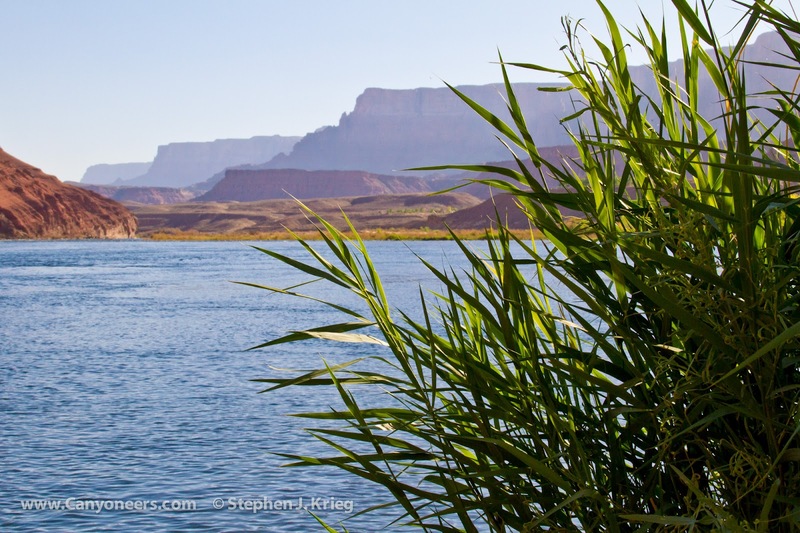 It's an historic site, in that it was a commercial river ferry crossing location, from the pioneer days (beginning with John D. Lee, hence the name) until the construction of Navajo Bridge about five miles downstream finally brought reliable, safe highway access across the Colorado River there in the form of US 89A. 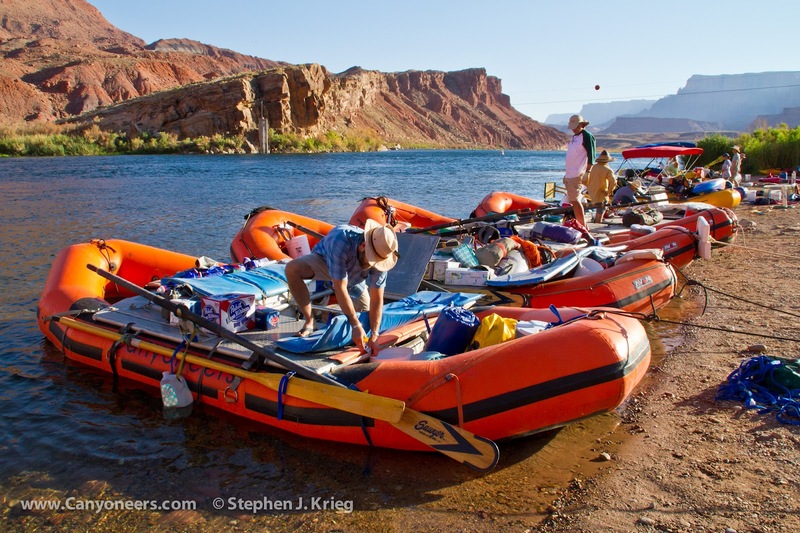 On this fine June afternoon, Canyoneers' crew were unloading their boats, rigging them up and loading supplies for the two week June trip through Grand Canyon. It was hot -- about 101 F. -- but as always the river water was very cold, making it relatively easy to get cooled off as need be. And to keep one's jug of water cold by setting it into the river's edge or tied to one of the rafts. The main fleet consisted of five bright orange 18-foot Avon inflated rafts, each of which would carry four passengers in addition to the river guide who would be rowing through most of the 277 river miles of Grand Canyon. 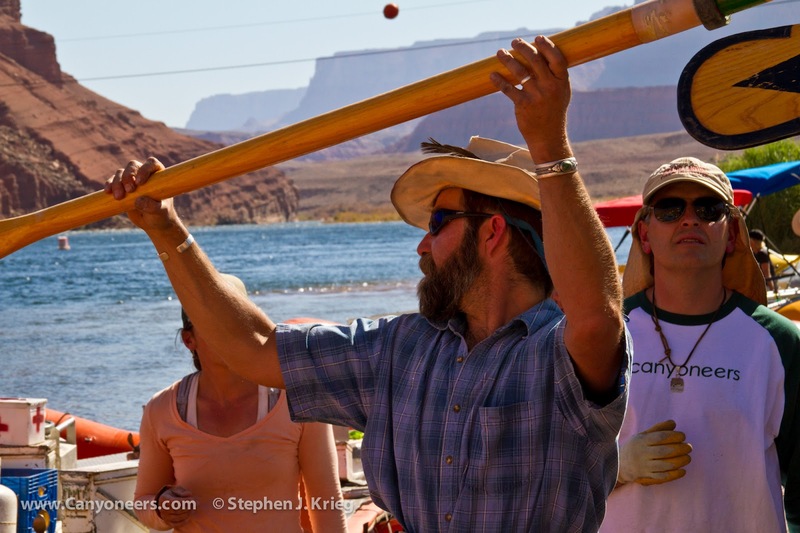 This would be a "motor support" trip, meaning one of Canyoneer's huge 37-foot C-Craft motorized rafts would be along. The big boat would not be in the midst of the oar boats, but would go on ahead, carrying many more big ice chests of food and other supplies. Sometimes called "the mother ship" by passengers, it also carried the portable kitchen, making it a floating, traveling restaurant. 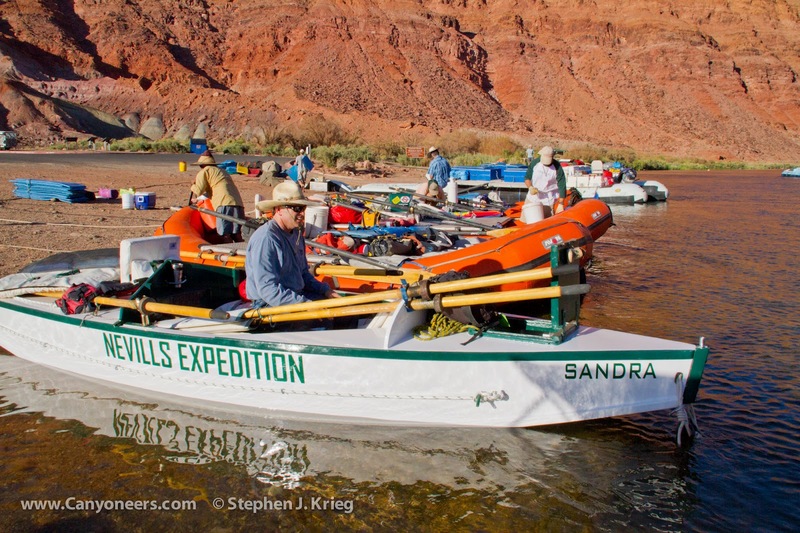 The showcase of the Canyoneers oar trips is the Sandra, a little white-with-green-trim wooden cataract boat that has quite a history to her. 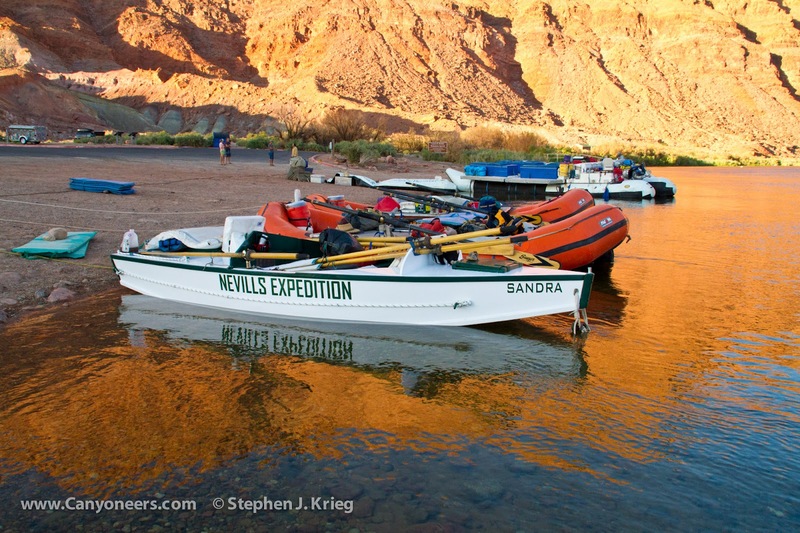 The last boat built by legendary river runner Norman Nevills before his untimely death in an airplane crash in 1949, the Sandra is fully restored and owned by Nevills' grandson, Greg Reiff of Flagstaff. 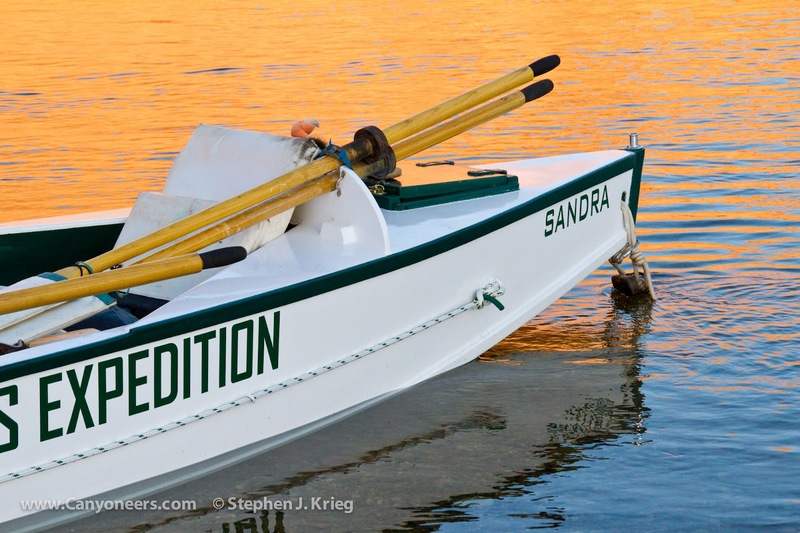 The boat was named for his mom, Sandra Nevills Reiff. Greg rows the Sandra on the June and July oar trips. In August she is usually rowed by Andy Hutchinson, a master boat builder who did most of the original restoration work. Lees Ferry is also a magical place, in terms of scenery and photography. Besides having the Colorado River, the scenery is spectacular by having the Vermilion Cliffs on one side of the river and the Echo Cliffs on the other side. Add to this mix the clear blue Arizona sky and it's pretty impressive. Moreover, the closer it gets to sunset, the more special the light gets. With the Vermilion Cliffs so tall, so steep, and so close to the river, the low angle of the nearly-set sun lights up the reddish-brown cliff, until it's almost orange in color. 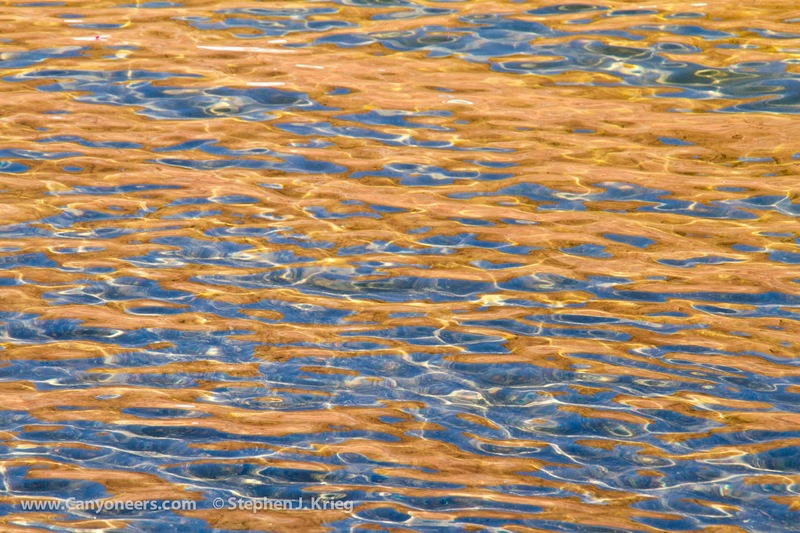 The clear river reflects the orange of the cliff and the deep blue sky onto the river's surface, creating a unique color display. No "Photoshop-ing" needed!